Oh wow, have we reached the very end or are we scraping the bottom of the proverbial barrel? Can you believe this, I've never eaten at Swiss Chalet. No joke! Now that isn't that much of a oddity as I've never seen the need to dine at this blast from the past. In fact, I think the bulk of the clientele are from a certain vintage. Viv has been there a few times and has actively urged me not to visit the place. Hence, this is probably the main reason it has taken that long to blog about it. I literally had to drag her and the kids out there for dinner! 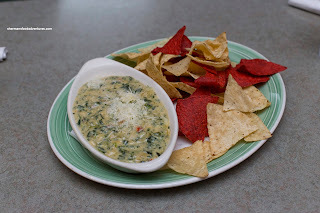 So to start things off, we ordered the 4-Cheese Spinach Dip with tortilla chips. I've often wondered why restaurants never give enough chips for the amount of dips (maybe they fear wastage?). Well, this was the case here too. Positive note, there was plenty of dip... It was pretty standard being creamy and cheese with soft bits of spinach strewn throughout. Nothing special, but at the same time, totally fine as well. For Viv, she didn't go for the chicken nor ribs, rather, she had the Chicken Pot Pie with a side of green salad. 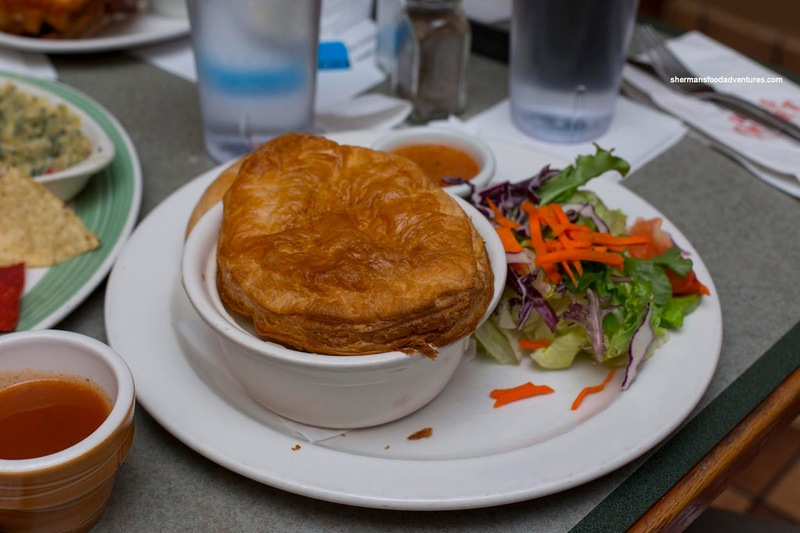 Not trying to sound completely indifferent, this was a standard chicken pot pie. There were chunks of tender chicken in a thick chicken gravy with the usual veggies. This was topped off with a piece of puffed pastry. Once again, it did the job with very little fanfare. 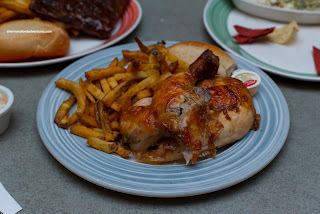 For myself, I decided to go for the classic Half-Chicken Dinner with fries, roll and Chalet sauce. In terms of roast chicken go, this was decent. The skin was attractively hued and well-rendered. I thought the meat was past the point of being juicy though. Costco chicken has a better texture in my opinion. With that being said the Chalet chicken was far from being dry. As much as Viv doesn't like the Chalet sauce, I thought it was fine and helped provide moisture and flavour. The best part of the dish was actually the fries, nicely crispy and potatoey. 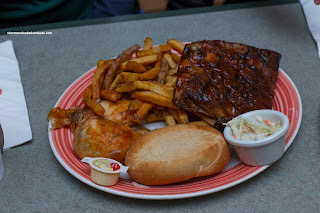 My son went big and had the 1/3 Ribs and 1/4 Chicken with fries. Once again, the ribs weren't necessary something super memorable, but for a standard chain restaurant par-boiled then flame-grilled version, this was fine. The meat was fall-off-the-bone tender and well-sauced. For dessert, we got the Mini Cinnamon Sugar Donuts to share. I wasn't a huge fan of these as they were completely oil-soaked. It was like eating an oily sponge that tasted of old oil. Not even the sugar or chocolate sauce could do anything to mask it. 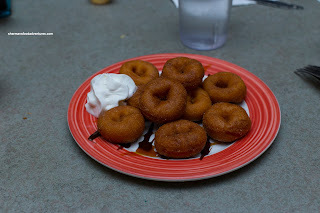 Donuts withstanding, the rest of the food was fine, but nothing particularly special. I must admit it was better than I expected and the fries were on point. 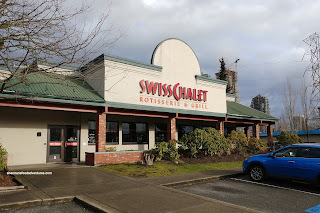 Yet, as I soaked in the 90's decor and atmosphere, I couldn't help but think that Swiss Chalet needs a complete overhaul in order to attract a younger demographic.